The art of storytelling has been around for thousands of years. In 1994, Dana Atchley and Joe Lambert modernized storytelling by founding the Center for Digital Storytelling in San Francisco. Their initial digital stories were personal memories augmented with images, recorded narration, and music. Digital storytelling provides students with a powerful 21st century learning experience that capitalizes on their interest in technology and their skills with it. Managing the process of crafting a powerful digital story provides opportunities for students to work on project management skills like organization, time management, leadership, initiative, persistence, and teamwork. Digital storytelling is more than just supplementing text with technological baubles. Learners must distill essential ideas from their research, identifying reliable text and supplementing it with imagery, and synthesize this knowledge into a deliverable that evidences their mastery of the content being studied…regardless of the subject or discipline. The original narrative form of digital storytelling is a powerful way to engage learners in writing, but there are many other formats you can implement to build literacy while encouraging deeper thinking about the content being studied. Here are six examples. Ask students to carefully read each line or stanza of a poem and discuss the author’s word choice. Students should then find or create images for each line or stanza to illustrate the author’s intent. Students should also find or create music to reinforce the emotions the poem evokes. As they record the text of the poem, they practice fluency and intonation. The final product is a multimedia version of the poem… a digital story that helps a viewer better understand the poetry. Student book reports, even digital ones, tend to be superficial information dumps: the title, the author, a summary, and an opinion. Instead of this sort of low-level book report, ask students to create a short, fast-paced book trailer. Much like the movie trailers students are familiar with, book trailers should be designed to hook the audience, showcasing the text in a way that motivates viewers to choose this particular book from the library. Ensure that students’ book trailers go beyond basic information about a book. Students should use what they know about the characters and conflict to connect viewers with the story. As students develop a “hook,” summarize the story, and employ persuasive techniques to entice others to read, they learn how to use media to change behavior and develop a better understanding of how the mass media uses those same techniques. Our students have grown up watching television. Many students spend nearly as much time watching TV than they spend in school! One of the few television program types kids do not enjoy watching is, of course, the news. Challenge your students to come up with a news report they would actually want to watch based on the content they are learning. Students crafting an interesting news report must organize and summarize information, helping them better understand and retain the content. To be clear and concise, students need to focus on interesting, accurate vocabulary and terminology. As they rehearse and record the reports, they practice intonation and build fluency. There are few tasks in school, students dread more than writing a biography. Motivating students to do their best work is sometimes difficult, especially when they realize that no one other than their teacher will see their work. To give student writing additional importance, create an audience more expansive than the walls of your classroom. Remind students that biographies aren’t always books…perhaps they have watched television shows about a favorite singer or musician or enjoyed an A&E biography about someone they admire. Using a digital storytelling approach to biographies helps prevent their writing from becoming a list of unrelated facts. As students combine their research results with imagery, sound, and other media to create a compelling narrative, they learn that even biographies can be informational and powerful. Assignments that ask students to summarize and share information as a report or presentation are easily completed by copying and pasting from source materials. Asking students to present their research results as a first-person interview makes information dumping much more difficult. A typical interview is a question-and-answer session between two people, but you can expand the definition to include animals, viruses, or even a historic artifact. Interviewing non-human subjects, like the polio vaccine or the boat Washington used to cross the Delaware, provides awesome opportunities for student expression. A first-person interview requires students to recode information into their own words. It helps them learn to arrange, combine, and prioritize facts and ideas. In a world awash with information, interviewing helps students realize that knowing which questions to ask — and how to ask them — is as important as knowing all the answers. Many of today’s important issues, like climate change and public health, cross curricular boundaries between language, science, and social studies. Tap into student passions by asking them to create public service announcements (PSA) that inform viewers about these issues and encourage them to take action. To craft an effective PSA, students must become powerful communicators who can use organization, voice, and word choice to raise awareness and change behavior. Developing a PSA also provides an authentic reason to consider audience and combine informational, narrative, and persuasive writing. These six ideas are just a taste of how digital storytelling provides students with opportunities to practice essential literacy skills and make powerful personal connections to the content they are learning. 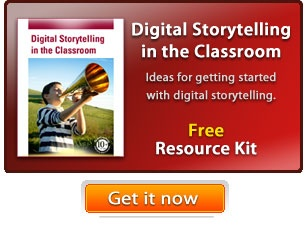 If you are excited to learn even more, explore the Creative Educator collection of digital storytelling lesson plans.